While science has come a long way in terms of our knowledge about evolution and life forms, a new study has provided some additional clues to earlier life forms on Earth. Not only that, but we have a sense of what these earlier life forms looked like. Researchers found that some kinds of bacteria could do anything from swimming and changing into newer kinds of bacteria to developing into a dangerous, virus form without any DNA. To fully understand this new information that researchers found, you have to consider how bacteria work. Some bacteria rely on RiboNucleic Acid (RNA), which at a very simplistic level can be described as the 'middle-man' between DNA and the production of proteins. Your proteins are vital to carrying out important functions in cells. Yet, new research suggests that protein perhaps wasn't so important at one point in time. On top of that, RNA played a much bigger part than its current role today. The research shows that for bacteria, proteins aren't consistently as important for carrying out cellular functions. Still, it's a curious question as it was wondered just how RNA could play such a big role and coax all of these changes when we consider that today, the proteins in our cells would be necessary. The answer was an interesting challenge, but scientists found that there were minuscule RNA molecules in the shape of a circle. Known as cyclic di-GMP, these molecules could turn a gene on or off. Also, they could direct whether bacteria would swim, for instance, or not move at all. In fact, cyclic di-GMP would determine a huge array of functions for a bacterium. It is this little RNA molecule – cyclic di-GMP – that can bring to life a bigger RNA structure known as a riboswitch. These riboswitches are a relatively new discovery over the last decade and research has shown that they can impact quite a lot of functional activities in an organism. Found inside individual pieces of messenger RNA, riboswitches can direct genes to turn on and off, which contrasts with our previous knowledge that this is a role only for proteins. This use of RNA by a bacterium would therefore precede any large and important changes – doing so without any contribution from proteins. But now, a bigger question remains, which is the question of how DNA came into existence if proteins are mandatory to carry out all of the vital functions of life. It is this recent study that has addressed this complicated question. 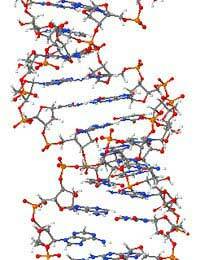 Researchers think originally, the individual nucleotide strands that make up RNA were the first life forms. During this time billions of years ago, it is thought that these single strands had a major responsibility for vital life functions in bacteria. Basically, they carried out the necessary functions that proteins do today. One of the interesting and exciting aspects of this research is that it could actually pave the way for improved medical treatments. Scientists think that if a molecule mimicked the cyclic di-GMP, it could wipe out some of our modern, dangerous bacterial infections. For now though, the research has at least provided new information about some of the earlier life forms on Earth.